The Willaura and District Quilters have donated two beautiful quilts to 70 Lowe Street. The inspiration for the two quilts arose out of a ‘show ‘n tell’ at the EGHS Residents’ Support Group AGM in 2017 by Quilters’ group member Heather Fleming. 70 Lowe Street manager Tanya Haslett asked if a quilt might be created to cover deceased residents as they make their final journey from Lowe Street. “The group readily agreed and the beautiful blue, green and mauve quilt was produced,” Heather said. The Willaura and District Quilters formed in 1990 when six women were taught the skills by their friend and expert quilter Sandie Rankin. Since then the numbers have grown and now there are around 15 women from Willaura and the surrounding district. 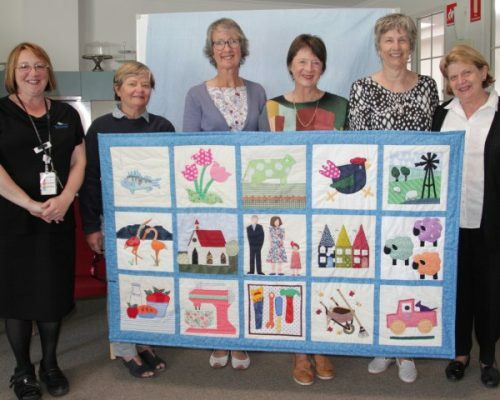 Over the years the group has made many quilts, some for their own members’ special occasions and many to raise funds for much needed causes throughout the region and Victoria. East Grampians Health Service has often been the beneficiary, with quilts being made for Parkland House Hostel, the Ararat ‘Building for the Future’ appeal, the EGHS Oncology Unit, the neonatal ward, the Ark Toy and Activity Library and the ‘Look Good, Feel Better’ men’s health program. The two quilts were presented to 70 Lowe Street residents, staff and Residents’ Support Group members during a morning tea, and all enjoyed the opportunity to chat together about the pleasures of home, friendship and sewing.